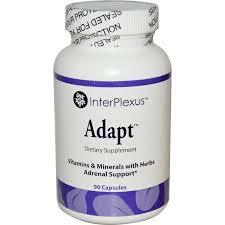 THIS PRODUCT CONTAINS 11 SPECIFIC NUTRIENTS FOR ADRENAL FUNCTION. Adapt™ was developed to promote the adaptation of individuals to stress. Under stress a person may experience a depletion of critical co-factors that are essential in protein and carbohydrate metabolism.Furthermore, Adapt was formulated to address common problems encountered in objective stress measurements of thousands of people.